In a simulation, dark matter flowed away from the center of a galaxy as new stars formed. 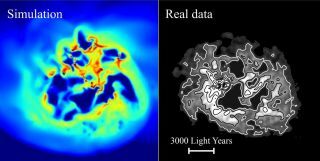 Real data about that galaxy, on the right, closely matches the simulation. Dark matter detectives barely know anything about dark matter, but now they know this: It behaves differently on the fringes of old galaxies than in new ones. Dark matter is the stuff we can't see in the universe. It makes up most of the mass in the universe but doesn't emit light. However, it does tug on everything with gravity. Everything in the universe acts like it's being pulled on by big heavy clouds of something we can't see. Astronomers just aren't sure what that something is. A new paper, published Jan. 3 in the journal Monthly Notices of the Royal Astronomical Society, helps to narrow it down, though. Most of the dark matter that scientists are aware of exists in "halos," or clouds within galaxies. But there's a problem: Those cores don't behave the way they should, according to computer simulations. The popular explanation for the cusp-core problem, called the "Self Interacting Dark Matter" (SIDM) model, suggests that not only does dark matter exist entirely outside the physics we're able to directly detect and understand, but it also acts on itself using unknown forces. If dark matter's interactions with itself differ from its interactions with ordinary matter, that could explain how it's managed to travel from the centers of galaxies out toward their edges. But this explanation might be overcomplicating things, the new study suggests. Another force could shove dark matter out of the center of galaxies: dark matter heating. That refers to intense energy and wind from star formation shoving dark matter out of the centers of galaxies (where most new stars form). But there's little direct evidence for this phenomenon, and even if there were, it's not clear whether such heating would be powerful enough to explain the discrepancy between models of dark matter distribution and what observations show. This new paper, though, suggests that dark matter heating is the correct explanation. The authors studied 16 dwarf galaxies divided roughly into two categories: galaxies that stopped forming stars billions of years ago and galaxies that stopped forming stars more recently or are still forming stars. The researchers found that the older, less-active galaxies tended to have dark matter cusps — regions at their centers with lots of dark matter. More-active galaxies tended to have empty cores. The new findings suggest that dark matter heating is real and plays a significant role in how dark matter behaves, the researchers wrote. Galaxies that long ago stopped forming stars also had less energy to shove dark matter out of the galactic center. In those cases, dark matter behaved in the way simple models predict it should. More-active star-forming galaxies had more heating, and that made the dark matter there deviate from the models. If this finding is correct, it narrows down the possibilities of what dark matter could be, though not dramatically: It just has to be something that would be blown out of the center of a galaxy with lots of new stars. And this result might mean it's unnecessary to propose all sorts of bizarre dark matter properties to explain how the substance behaves. Still, nothing is yet certain. The researchers acknowledged in their paper that they relied on methods for simulating dark matter that have come under some criticism. There could be other galaxies out there with properties somewhere between the cusp and core models, which would complicate the new findings. For now though, dark matter detectives can tack another piece of evidence to their bulletin boards covered in red string.